Opportunity knocks! Situated on a double lot, this historic home is seeking cosmetic renovation or the opportunity to take advantage of the large lot, zoned NT-2 on a 100' x 125'corner lot with alley access and a detached 2 car garage. The current structures appear to encroach into the second lot. Similar new construction projects are underway in this location. The home, built in 1924 - likely a Sears, Roebuck & Co kit home - offers charming exterior & interesting roof lines with great exterior appeal. 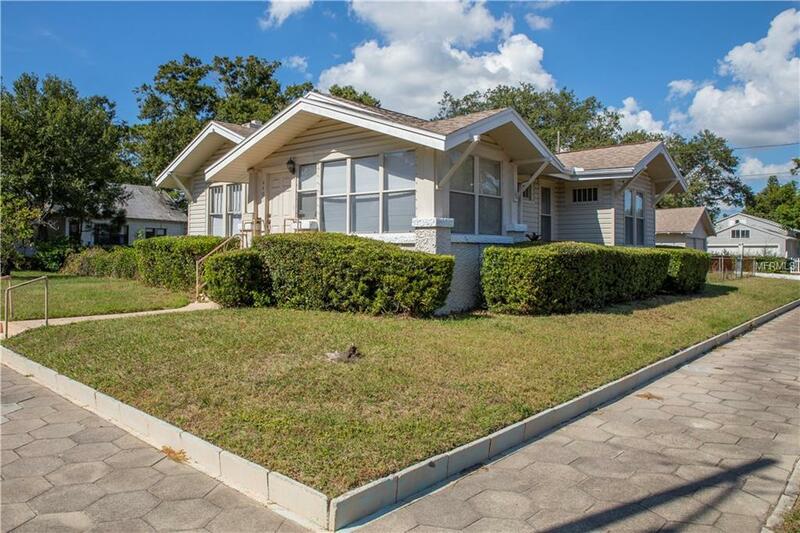 Situated on a large corner lot with large yard this could also be an excellent remodel project. Interior front porch was enclosed and a large living room and dining room with hardwood floors create a large, open living space. Wood burning fireplace in the living room along with some original charming features. The kitchen has the original 1920's wood cabinets and all appliances have been removed. A mud room and storage closet lead to the back door. Two bedrooms are separated by a hall bathroom with tub shower. The detached garage offers space for 2 cars and a workshop / laundry room with a shower stall. ROOF replaced 2010, AC 2014, hurricane shutters 2009. Great corner location with historic hex block sidewalks on the east and south side of the home. Priced at recent appraisal which is available upon request.